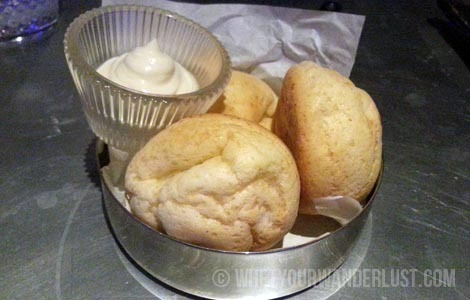 Last month I was invited to try Spirito, Media One’s new Brazilian dining concept. (Oh no, not another Dubai churrascaria, I opined.) My date and I arrived for dinner and drinks at 7pm on a Thursday night not quite knowing what to expect. 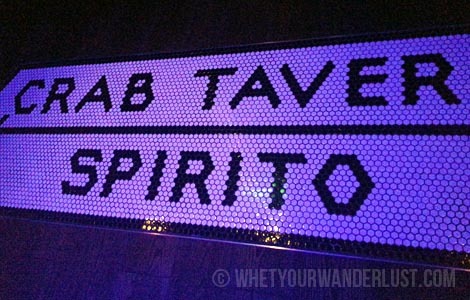 Spirito is far from a churrascaria. 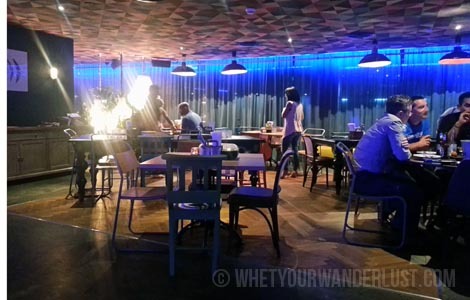 It’s a Brazilian tapas restaurant with a separate bar/lounge area, with a menu full of sharing plates and a smaller selections of mains. The interior of Spirito is very boho-chic, dimly lit with a smattering of statement chandeliers, mismatched chairs and tables. The hostesses all seemed to be towering above me, looking very stylish in their maxi-dresses. The waiters are in bombachos. The clientele are your 20 to 30-something media types. The vibe is chilled with Latin grooves pulsating in the background. 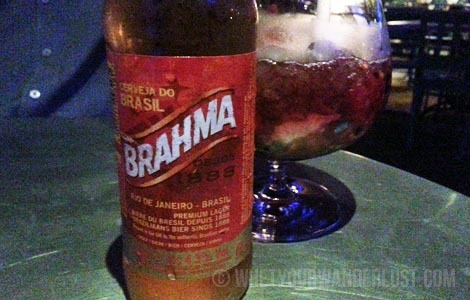 And of course, you can even get a real Brazilian beer. Great! So Media One is already known for its trendy watering holes. But what about the food? 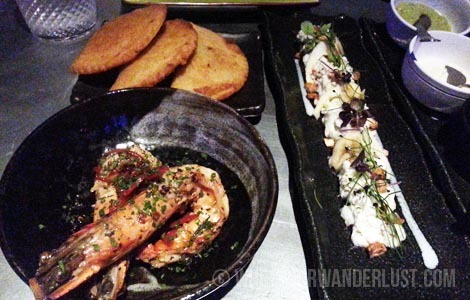 I was surprisingly impressed by the starters I sampled, which all arrived to the table in record time: Brazilian cheese puffs, smoked chicken croquettes, garlic-chili prawns, pastry filled with braised beef, cod ceviche. Well-presented, but even more important, fresh and tasty. 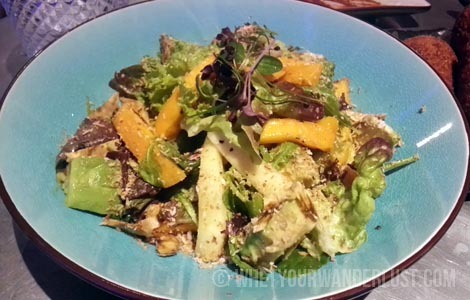 I always enjoy unusual combinations of ingredients so I also sampled the mango salad (mixed leaves with mango, avocado, lime, chili, toasted coconut plantain crisps), which I thoroughly enjoyed. The list of mains was heavy on the meat and far less extensive. You can choose from two different seafood sharing platters, three grill options, or six “large plates” (mains), with only one veggie option. (Sorry, vegetarians!) We ordered the “lobo” (black angus steak, cocoa and chili rub and spiced polenta fries) and the veggie risotto (beetroot, blue cheese risotto with cashew nuts) to share. 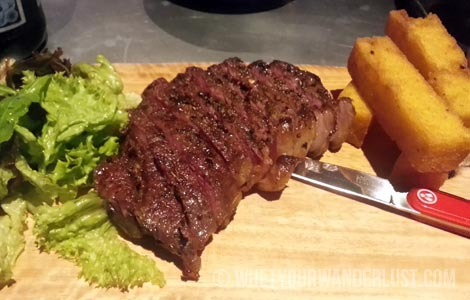 The steak didn’t impress me much – a bit chewy and difficult to cut with the dull knife I was given (which I thought was a Swiss army knife due to the bright red handle) – but props for the chunky polenta fries. 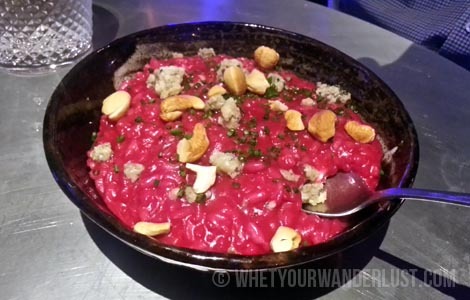 The beetroot risotto, however, was moreish and better cooked than risotto I’ve recently eaten at Italian restaurants. And who could resist that gorgeous magenta colour?! 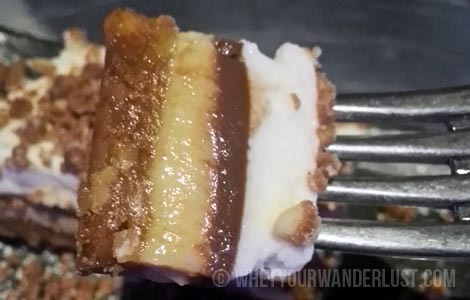 The recommended dessert was a traditional Brazilian desert called Torta de Sonho de Valsa. This is a very sweet and deceptively light, layered dessert made from the popular Brazilian Sonho de Valsa chocolates (chocolates with a cashew nut filling), a condensed milk cream, chocolate cream and whipped cream. Though I can’t comment on the authenticity of Spirito’s bon-bon cake recipe, we devoured it despite the fact that we were already completely stuffed, which says it all. If you find yourself thirsty and peckish in Media City, with a hankering for some Brazilian flavour, it’s worth trying Spirito. 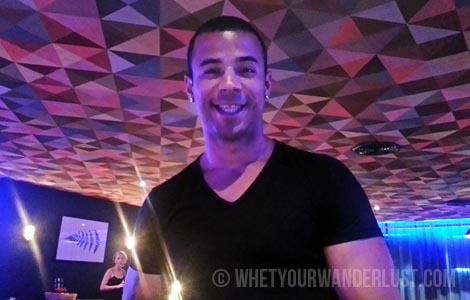 Say hello to our waiter, all the way from Sao Paulo. Happy hour runs from 6 to 9pm with selected beverages at AED 30, such as a bottle of Brahma, and they will shortly be launching a Ladies’ Night and Friday Brunch.